If you embellish something you make it more beautiful by decorating it. Torsion is the strain produced on a body by twisting it. Nina’s long and tortuous journey was filled with twists and turns along the mountain road. Although Nina had noticed that her chosen route would have many bends, she had had no idea that she was in for such a tortuous or complex ride. When she had finally navigated through that winding, tortuous, and roundabout road, she felt like she too was all wound up. Quiz: Try again! When is something considered tortuous? When it takes all day long to complete. When it almost makes you sick. When it is complicated with many turns and bends. Problem Tortures Us The math problem was so tortuous and intricate with so many twists and false turns that it simply tortured us; we never did solve its complexity! Something tortuous, like a mountain road or difficult language, is “twisted, wound, or wrapped” up so as to make it complex to navigate. 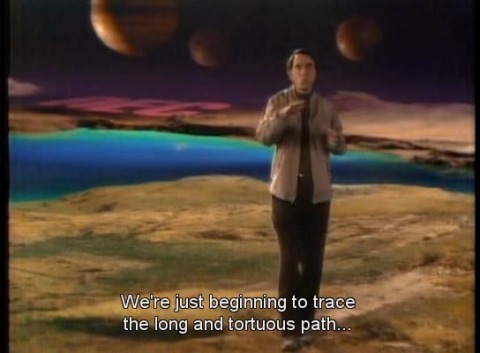 Cosmos Carl Sagan talking about the tortuous path that began with the Big Bang and has progressed to the present day.